Galina was born in the Ukraine and comes from a family of musicians. 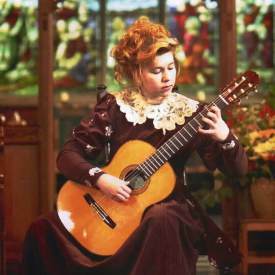 She began studying the guitar and made her first public appearance on state television at the age of eight, four years later she was performing guitar concertos with the Kharkov Philharmonic Symphony Orchestra. From 1985 to 1991 she studied at the Moscow Gnesiny Music College while also employed as principal guitarist with the Kharkov State Philharmonia from 1986 until 1997. Galina has won prizes at international music competitions in Poland, Italy, Hungary, Spain, the United Kingdom, and has performed over 2,000 concerts across West and Eastern Europe. In 1996 the British Ambassador and High Commissioner to Kenya invited her to Africa for a concert tour and television appearances. Her recitals have included very technically demanding works, such as the arrangement by Japanese virtuoso guitarist Kazuhito Yamashita of The Bogatyr Gate of Kiev (from Pictures at an Exhibition by Mussorgsky), considered "impossible for guitar" (Ganiezc Pomorsky) alongside her own arrangements of works like Rachmaninov's Prelude in G minor. Her repertoire has ranged from 'orthodox' classical guitar (Sor, Villa-Lobos, Bach ...) through arrangements of classical instrumental, orchestral works and opera (Liszt, Paganini, Dvorak, de Falla, Rossini), the modern guitar (Walton, Rodrigo, Dyens), to flamenco (Escudero, Sabicas, Pena) and arrangements of South American and East European folk music (Cardoso, Ramirez, Shevchenko). Her interpretation of pieces by the famous guitarist composer Stepan Rak inspired his praise before a huge audience at the 1987 Esztergom International Guitar Festival ... "finally I have found a musician who can perform my music!" She has also starred in three music films produced by Ukrainian State Television; Portrait with Guitar (1987), Strings and Sails (1991), Spirit of Spain (1997). Her first CD The Legend received funding from the Gendai Guitar Foundation of Japan and was released in 1996 (under her maiden name Galina Vernigora). It featured on US FM radio in the network programme edition of Great Women Guitarists produced by 'Classical Guitar Alive!' in 1997 and later with Maltese National Radio on the programme Cantabile. Galina Vale now lives in England and continues with her career as a concert performer.